When God delivered Israel from slavery to Egypt He also intended to bring them into a promised land flowing with blessing and prosperity. The children of Israel however didn’t cooperate with the plan designed to benefit them. They complained and fought against God almost every step of the way. The Bible states these ancient events serve as our examples, that we might learn from them. Thus we also see why we struggle so much with our own journey from slavery to sin, to possessing our inheritance in Christ. Let’s see why God wanted us to observe their journey and what we can learn from the 14 times they complained. #1 – The people complained to Moses that because of Him and His talk of a promise land, Pharaoh made things worse for them – Exodus 5:1-22 This is when the enemy creates pressure at home, at work or school to discourage you at the beginning of your Christian walk. Out of nowhere, your responsibilities at home, work or school suddenly increases and requires you to meet impossible deadlines and quotas. 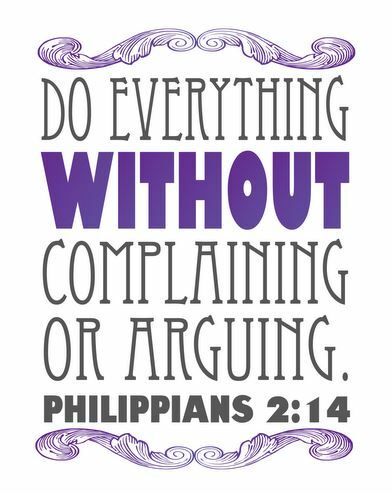 Your workload and the extra overtime “scatters” (verse 12) you, and you feel like you are taking a “beating” (verse 14). Your family, your boss or supervisor blames you and your sudden interest in “Christian things” for not being able to do your job. #4 – The people complained about being hungry; God gives them Manna – Exodus 16:1-4 This is when your spiritual growth produces greater hunger. However, its the not the earthly food we are used to; God begins to feed you with heavenly food. The irritability during the infant phase seems constant. #5 – The people complained about being thirsty – Exodus 17:1-4 This is when your spiritual growth produces greater thirst. God seems to allow the thirst and the hunger to teach us where our provision truly comes from. After complaining 5 times God begins to take out His belt! #6 – The people forsake the Lord. The Lord orders the Levites to kill 3000 people by the sword, because they worshipped the golden calf. – Exodus 32:28 This is when you recognize just how impatient our flesh-nature is when it comes to the things of God and how inclined we are to worship anything but the One True God. Instead of waiting for 40 days for Moses who was on the mountain, they forsake the Lord and created their own idol/God. #7 – The “mixed multitude” of the people complained about food – Numbers 11 The Lord burns the outskirts of the camp – Moses wants to die – The Lord sends a very great plague v.33 Here you become so dissatisfied with the spiritual diet God has given you, that you may wonder why you even became a Christian (v.20). This is where the confusion of being in a crowd of people with varying degrees of opinions and commitment to the Lord exasperates the problem. The ongoing process of further weaning the people from the world’s food comes to a head. The next test the people face was the test of leadership; knowing the importance of not only following God but following His delegated leaders. #9 – The people complained about how difficult it looked to conquer the giants in the land so they refused to enter the Promise Land. Numbers 14:1-10 Because the path the Lord has chosen to develop His people is almost always humanly impossible and difficult, it can cause some people to freak out and desire to go back to their old life. These people didn’t want to have to depend on the Lord this much in order to go forward. #10 – The people complained again and wanted to kill Moses – they try to select another leader. The Lord seeks to destroy the people with pestilence – Numbers 14:10 Some believers will attempt to “vote out” their spiritual leaders; hoping to select leaders who will lead them into a more prosperous path. When it doesn’t look like they can replace their leaders they actually tried to kill them. #11 – The key leaders rebel against Moses – Numbers 16 – God gets serious and opens the earth and swallows the offenders! This is when the bitterness of a few disgruntled leaders defiles many and God has to stop the coup. This is the 5th time Moses intercedes for the people – Numbers 16:45-49 – God kills 14,700 people. #13 – The people contended with Moses again because of no water – Moses gets angry Numbers 20:1-5 The people gather against Moses again. This is when the people’s rebellious nature comes to a head. This even blows Moses’ circuit breakers as he runs out of grace for these clueless people, resulting in Him becoming embittered and losing out on the Promise Land as well. 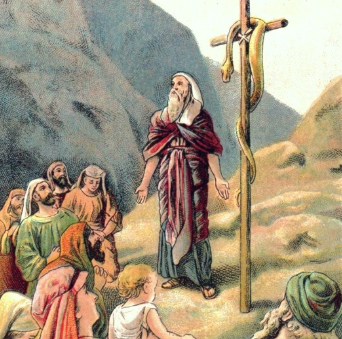 #14 – The people complained against God and Moses – Numbers 21:4-5 – God finally brings the solution – The fiery serpents to bite them – He shows them the depth of their sin-nature. This is perhaps the most important of all the lessons during their wilderness journeys. God finally gives them a taste of their own hateful medicine. They were to experience the same painful poison they were dishing out. As a recipient of their own venom, they finally recognized the death that was in them and cried out to the Lord; acknowledging they sinned against God and Moses (V.7). The good news is God doesn’t leave us frozen by the horror of seeing our grotesque selves. He also reveals His boundless mercy and compassion towards us. It is truly amazing to consider that the one and only true God, the righteous and holy Creator of the universe, patiently puts up with us, and then dies for us; even the death of the cross. How could anyone not want to serve an awesome God like this?